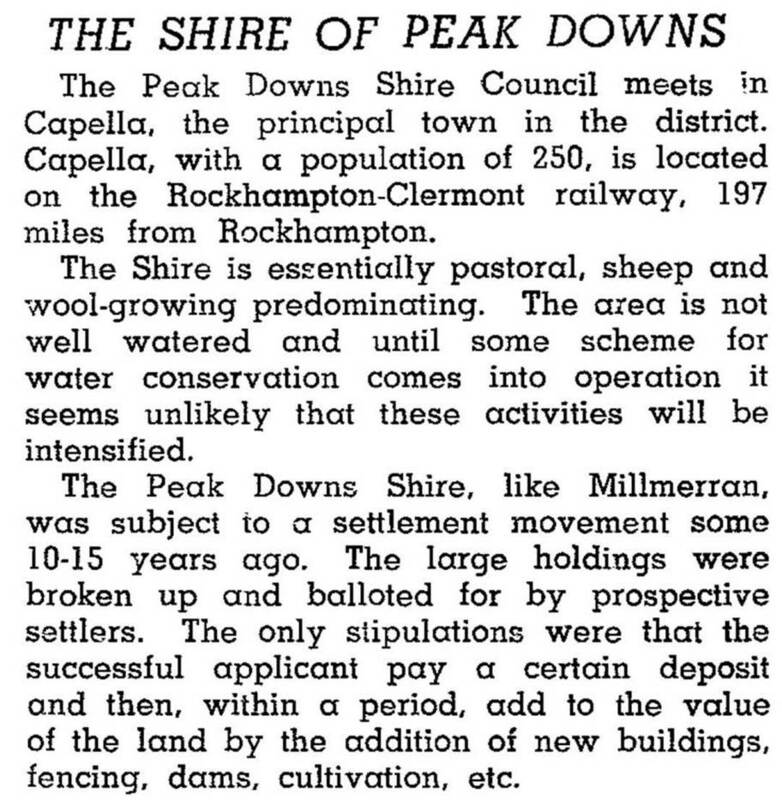 Peak Downs Shire, an area of 8127 sq km, and generally 250 km west of Rockhampton, was amalgamated with three other shires in 2008 to form Central Highlands Regional Council. It extends almost to Clermont in the north and Emerald in the south, with most of the eastern half underlain by coal. The Peak Downs area was explored by Ludwig Leichhardt in 1845 who described the Peak Range, naming several of its highest points. The country around the range was compared with the Darling Downs. Several pastoral runs were acquired by the Archer brothers in the mid-1850s, one of them being named Peak Downs. At about this time the Queensland British Food Corporation invested heavily in grain production, but met with patchy rainfall and withdrew in 1954. Sufficient was achieved, though, to persuade local farmers to diversify into sorghum and sunflower growing. Thirty years later a further boost came from the Oakey Creek open cut coal mine and the dormitory town of Tieri in the east of the shire. The railway line linking Oakey to the Mackay main line was built in stages (1972-83).